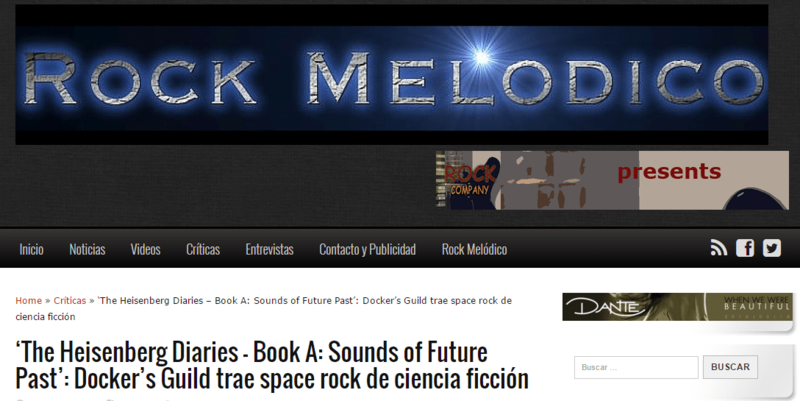 Docker’s Guild review on Rock Melodico! Docker’s Guild are back with a new CD, now with all the songs based on movie soundtracks and famous science fiction series, arranged in their particular style. The producer, composer and singer Douglas R. Docker is responsible for this fantastic project, which has its conceptual side called The Mystic Technocracy and has several albums to come: the first was’ The Mystic Technocracy – Season I: The Age of Ignorance ‘(2012) and now it’s the turn of’ the Heisenberg Diaries – Book a: Sounds of Future Past “. Co-produced and mixed by Alessandro Del Vecchio, numerous renowned musicians have participated in this work, as Roxy Petrucci on drums, Elisa Montin on drums, Anna Portalupi on bass, Nita Strauss and Mio Jaeger on guitars, and Amanda Somerville, Elize Ryd and Valentina Procopio, all with vocals. Thus, classics like “Barbarella”, “The Neverendingstory “, ” Flash Gordon”, ” Doctor Who “or “Suspension” are presented in a format that one could call space prog, but the original melody of the songs are maintained. Undoubtedly, a job highly recommended for lovers of sci-fi and everything related to soundtracks. Douglas R. Docker has worked with artists like Tony Franklin, Gregg Bissonette, Guthrie Govan, John Payne, Göran Edman, Tim Bogert, Tony Mills, Therion, The Vivaldi Metal Project, Frantic Amber, Shining Line and Craig Goldie, besides being keyboardist for melodic rock band Biloxi. ‘The Heisenberg Diaries – Book A: Sounds of Future Past’ is a must for fans of progressive, AOR and classic rock in general.